Fair Isle Knitting is fun! Here at Ewe Ewe Yarns we love to knit and we really love to knit with color. I dream about color and new color combinations so mixing colors comes easily to me. And I don't think there's anything more fun than mixing colors while I'm knitting. It makes projects fly along on my needles. A little green here, some brown here... And Fair Isle knitting makes adding little bits of color quick and pretty. Our Timber! Hat knitting pattern features this type of knitting throughout the hat. You can see how the saffron yellow mixes with the pistachio green zigzagging its way along the brim of the hat. 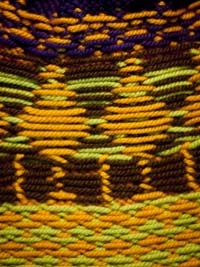 Then the yellow turns into a beautiful backdrop for the tree trunks in the center of the hat. We bring back the green and suddenly we have a leafy tree motif! The yellow then blends stitch by stitch with an indigo sky. How fun! But we always see the finished garment of a Fair Isle project and so many new knitters ask me HOW'D YOU DO THAT!?! that I wanted to show you the inside of our pattern. It should look almost as beautiful as the outside. Here's what it looks like on the inside. You can really see the trees in reverse! The whole idea is that you're working one stitch in one color and one stitch in another color; how you combine these stitches is how you make different motifs and patterns. Fair Isle knitting projects are great because each row is different and that makes me want to hurry up and get to the next row, then the next row, then the next row. And I eventually have to put down the knitting because my dogs have gone to bed and my husband is about to turn off the lights! So give Fair Isle knitting a try with Wooly Worsted, I hope you'll love it as much as I do!